"I noticed a red spot on the front of my leg," Peterson says. "It was about the size of a dime. It felt hot and hurt to touch." The spot grew quickly. "After a few days, it was the size of a softball," he says. Peterson realized he had a rapidly spreading skin infection. And he thought he knew where he might have picked it up: a creature preserved in the permafrost. In the past few years, there has been a growing fear about a possible consequence of climate change: zombie pathogens. Specifically, bacteria and viruses — preserved for centuries in frozen ground — coming back to life as the Arctic's permafrost starts to thaw. On the surface, it looked as if zombie anthrax had somehow come back to life after being frozen for 70 years. What pathogen would be next? Smallpox? The 1918 flu? The media took the idea of "zombie pathogens" and ran with it. "Climate change ... could awaken Earth's forgotten pathogens," The Atlantic wrote in November. "Many of these pathogens may be able to survive a gentle thaw — and if they do, researchers warn, they could reinfect humanity." "Scientists are witnessing the theoretical turning into reality: infectious microbes emerging from a deep freeze," Scientific American wrote. But something is a little fishy about these "zombie pathogen" stories: The evidence presented is as holey as Swiss cheese. The key researcher cited is a biologist who studies amoeba viruses, not human viruses. These so-called monster viruses have evolved to live in cold soil, deep underground, not in warm, human flesh above ground. And in terms of zombie bacteria, anthrax is a red herring. Anthrax has been "rising up" from soils all over the world for millennia, even longer. The bacteria survive by hibernating in the ground until conditions are right and then spring back to life. Back in the Middle Ages, it was common to see fields of dead sheep in Europe, wiped out by "zombie" anthrax. The French called these fields champs maudits, or the "cursed fields." Now there are some tantalizing hints that the Arctic is, indeed, a frozen champ maudits, filled with pathogens even more dangerous than anthrax. Across the permafrost — which covers an area twice the size of the U.S. — there are tens of thousands of bodies preserved in the frozen soil. Some of these people died of smallpox. And some died of the 1918 flu — a strain of influenza that swept the globe and killed more than 50 million people. But is there actually any evidence that these deadly viruses could survive a "gentle thaw" and then start a new outbreak? To figure that out, I headed up to the top of the world, where Zac Peterson was last summer, to see exactly what type of creatures — and diseases — are hiding in the permafrost. "We've got a head right here"
Up on top of an ocean bluff, Zac Peterson and a few students are on their knees, digging inside a hole that's about the size of a Volkswagen minivan. In 2013, a severe storm ripped off a big chunk of the bluff. 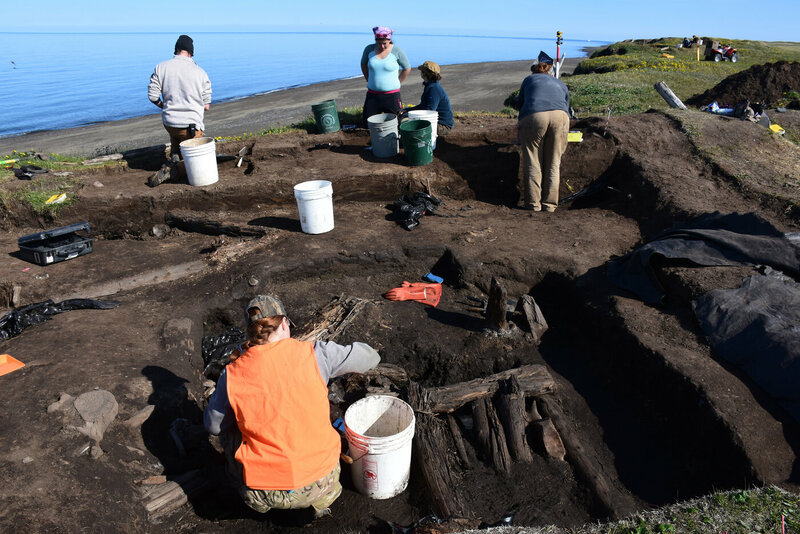 Now the 800-year-old cabin is teetering on the edge of a cliff, near the town of Utqiagvik in Alaska. The team is trying to pull off an emergency excavation before the cabin crumbles into the ocean. Hunters have been using this spot for thousands of years. At one end of the house, somebody was storing fresh kills. "We've got a head right here, and a main body right there," says Peterson, as he points to two mummified seals, lying face up in a soup of thawing permafrost and decaying sea mammal flesh inside the cabin. The seals are starting to warm up. Their organs are seeping out of their bodies and beginning to decay. The whole area smells like a rotting tuna fish sandwich. Peterson's pants are covered in black, oily goo. The seals have been buried in permafrost for about 70 years. They are incredibly well-preserved. You can see their skin, their whiskers and even something that looks like a flipper. 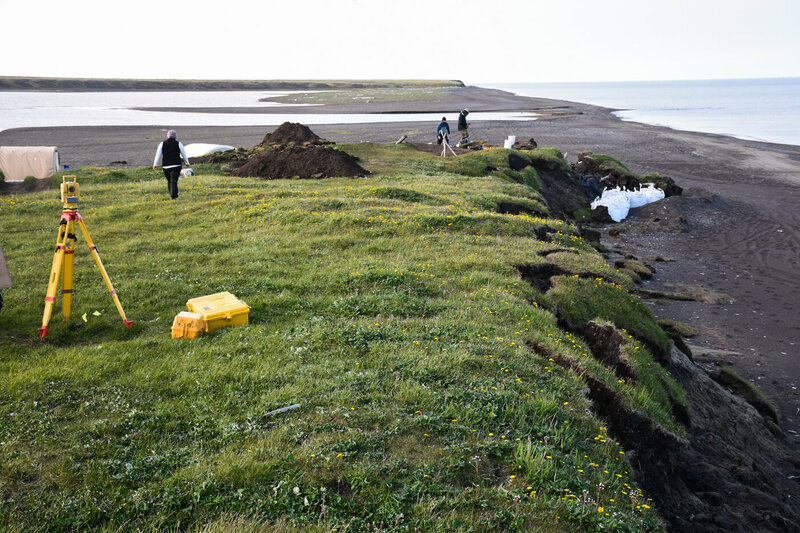 "That's what's so amazing about Arctic sites," says Anne Jensen, an archaeologist with the Ukpeavik Iupiat Corp. who is leading the excavation. "The preservation is amazing," she says. "It's like the animal just keeled over and died right then." Then something even creepier appears in the ice: a human molar. "It's just a tooth," Jensen says. "People lose them all the time. And then just throw them out." Now, this hunting cabin isn't built on a burial ground. Jensen doesn't think any bodies are buried near here. But Jensen is a world expert on excavating human remains from Arctic permafrost. "I've probably dug up as many burials as anybody, " she says. "I would prefer not to be excavating burials. But I've spent a lot of my career doing that." She has excavated everything from individual body parts — one time, she found just an upper arm in the ice, she says — to a massive cemetery, right here along the coast. In the late 1990s, the graves in the cemetery started washing into the sea because this stretch of the Alaska coast is eroding. The local government called Jensen in to save the bodies. She saved dozens. But a few hundred remain, threatened by erosion. Sometimes these mummified human bodies — which can be centuries old — are just as well-preserved as the seals in the log cabin, Jensen says. "The little frozen girl from Uquitavik, she was actually better preserved than the seals," Jensen says. "She was about the age my daughter was at the time, so it was really sad." Back in 1994, erosion exposed the body of a 6-year-old girl completely encased in ice for about 800 years. "Water had seeped into her burial," Jensen says. "So we took her out as a block of ice." The little girl was carefully wrapped in a duck-skin parka with a fur-trimmed collar. Her parents had buried her with a little sled inside their meat cellar. Her body was so well-preserved that Jensen shipped her to Anchorage so doctors could do a full autopsy. One of those doctors was Michael Zimmerman, a paleopathologist at the University of Pennsylvania who has been studying mummified bodies for 30 years. "When you open up frozen bodies from Alaska, all the organs are right in place and easily identified," Zimmerman says. "It's not like Egyptian mummies where everything is shrunk and dried up." Doctors can easily see why a person died. For the little frozen girl, it was starvation. But Zimmerman has seen infections in bodies excavated from permafrost. In one case, a mummy from the Aleutian Islands seemed to have died of pneumonia. When Zimmerman looked for the bacteria inside the body, there they were, frozen in time. "We could see them under the microscope, inside the lungs," Zimmerman says. But were these "zombie" bacteria? Could they come back to life and infect other people? Zimmerman tried to revive the bacteria. He took a smidge of tissue from the lungs. Warmed it up. Fed it. "But nothing grew," Zimmerman says. "Not a single cell." Zimmerman says he wasn't surprised the bacteria were dead. Pneumonia bacteria have evolved to live in people at body temperature, not cold soil. "We're dealing with organisms that have been frozen for hundreds of years," he says. "So I don't think they would come back to life." But what about viruses — like smallpox or the 1918 flu? "I think it's extremely unlikely," Zimmerman says. In 1951, a graduate student decided to test this out. Johan Hultin went to a tiny town near Nome, Alaska, and dug up a mass grave of people who had died of the 1918 flu. He cut out tiny pieces of the people's lungs and brought them back home. Then he tried to grow the virus in the lab. "I had hoped that I would be able to isolate a living virus," Hultin told NPR in 2004. "And I couldn't. The virus was dead. "In retrospect, maybe that was a good thing," Hultin added. A good thing, yes. But here's the disturbing part. Hultin tried to capture the 1918 flu virus again, 45 years later. By this time he was a pathologist in San Francisco. He heard scientists were trying to sequence the virus's genome. So at age 73, Hultin went back to Alaska. And he took a piece of lung from a woman he named Lucy. "Using his wife's pruning shears, Hultin opened Lucy's mummified rib cage. There he found two frozen lungs, the very tissue he needed," the San Francisco Chronicle reported. "Her lungs were magnificent, full of blood," Hultin told the paper. 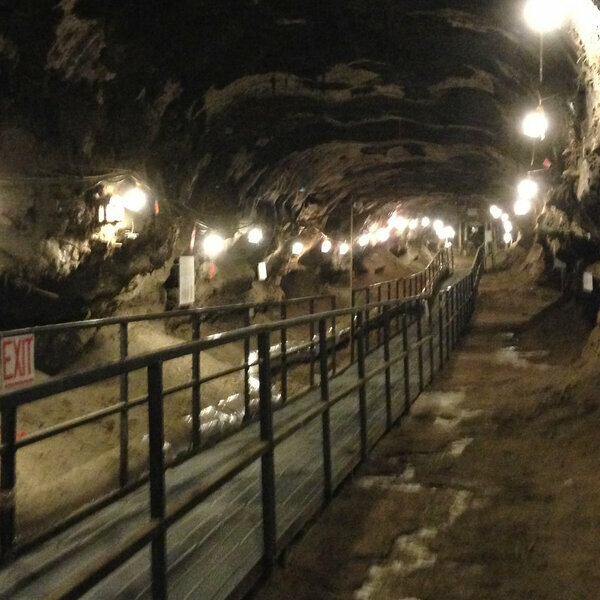 At the same time, a Canadian team of scientists went hunting for the 1918 flu virus in Norway. They dug up seven bodies. But none of them were frozen, and the team failed to recover any virus particles. In the 1990s, Russian scientists intentionally tried to revive smallpox from a body in their permafrost. They recovered pieces of the virus but couldn't grow the virus in the lab. All these attempts — and all these failures — make you wonder: Maybe it isn't melting permafrost we should worry about when it comes to zombie pathogens, but what scientists do in the lab. When I finished writing this story in December, I ended it with a faint warning about the dangers of human curiosity. I was convinced that the only way "pathogens" would rise up from the permafrost was if a scientist bent over backward to resurrect the creatures in the lab. The chance of it happening naturally seemed infinitesimally small. But then I received an email from Zac Peterson: "After kneeling in defrosted marine mammal goo ... doctors treated me for a seal finger infection," Peterson wrote. A photo showed a purplish-red infection covering the front of his knee. Seal finger is a bacterial infection that hunters contract from handling the body parts of seals. The infection can spread rapidly into the joints and bones. Sometimes people lose fingers and hands. The doctors never tested Peterson's infection to see if it really was seal finger. It responded well to simple antibiotics — the treatment for seal finger. The only seals Peterson had handled were those in the log cabin. Those seals had been frozen in permafrost for decades. "Even if there's a possibility it was something else," Peterson wrote, "I still tell people that I got infected by an 800-year-old strain of a seal hunter's disease that was trapped in ice." Peterson just might be the first victim of "zombie bacteria" rising from Alaska's thawing permafrost.